In February 2006, I made my first trip to Hiroshima. In October 2007, I made my second trip to Hiroshima. Hiroshima is a well known city. It’s the first city to be attacked by a nuclear bomb in 1945. Today, Hiroshima is better known for being the home of Mazda and Hiroshimayaki (Hiroshima style Okonomiyaki). 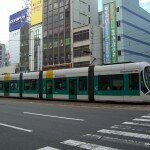 The city itself is very similar to many other medium-small cities in Japan and has a very interesting street car system. In 2006, I arrived into Hiroshima in the afternoon. I had previously spent a couple days in Kyoto and was extremely tired. I had a nice curry rice lunch before embarking on the trek into the city itself. My first afternoon/night was spent at Hiroshima castle. It’s a very nice place to visit and relax. There are many places to climb and explore. It is best to go there early as the castle grounds close early. Unfortunately, I didn’t arrive until after the castle itself closed, and the grounds were also closing. All I could do was take a few pictures and venture back into the city. On my second trip to Hiroshima, I had a lot of time to enjoy things. I could visit some of the ruins of the old army barracks, explore the outer wall, and quickly visit one of the restored sentry walls. It was a very peaceful place. I do recommend visiting the guard wall located at the main entrance of the castle grounds. It’s very beautiful and it has a unique smell. The castle itself isn’t amazing. The outside is the best, but paying the entrance fee is nice to get a good view of Hiroshima city. 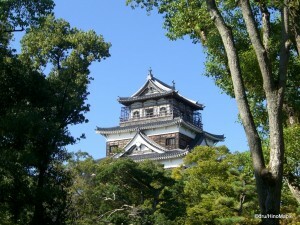 Inside, it’s a museum where you can look at how the castle used to look, and even try on a few pieces of samurai armour. Bring a drink when visiting the castle grounds as you will probably get thirsty. 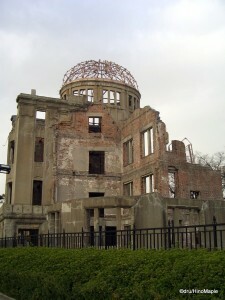 The second place you must visit when going to Hiroshima is the Hiroshima Peace Memorial Park. It’s a section of Hiroshima that was the focal point of the nuclear bomb. It’s something you should see when you go to Hiroshima, but be warned that I found it very depressing. It’s a necessary place to remind us of how devastating a nuclear bomb can be. The first stop for most visitors would be the Atomic-bomb Dome. It’s the ruins of Hiroshima’s Industrial Promotional Hall, and one of the only standing buildings in Hiroshima after the bomb. It’s a humbling sight and when I visited the Dome, it was cloudy, cold, and surreal. I had a truly eerie feeling looking at the dome. After visiting the Dome, a quick walk around the Memorial Park is a must. There are various memorials and statues erected to remind us of the death after the bombing. The Peace Memorial Museum is something I wouldn’t recommend unless you have extra time and nothing better to do. The artifacts and mannequins are amoung the most sobering and depressing things I’ve seen in my life. They have a few recreations of the aftermath of the bombing, various descriptions of what happened, and also many artifacts from after the bombing. The images you will see will be burned into your mind forever and you will probably feel extremely depressed. I regret entering the museum, yet, I’m happy I did. It’s a necessary evil in order to understand the true effect of nuclear weapons. 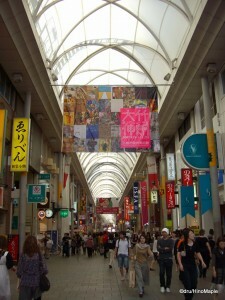 When you have finished visiting the sights in Hiroshima, the main shopping district is very close. There are many things to see and do, but if you have been to other mid sized cities in Japan, the shopping arcade will be nothing new. However, do try to find some okonomiyaki, oysters, and momiji manju. When you need some dinner, Ebisucho is a good place to find good eats. There are also many good restaurants near Shintenchi. If you are looking for gifts to bring home, the best place to visit is Hiroshima Station. Inside the station, there is a huge Omiyage floor with lots of things to buy. If you are travelling by Shinkansen to Tokyo, make sure you stock up on food and drinks on the way home. It’s a very long journey if you are using a JR Pass, or about 4 hours if you use a Nozomi train. This entry was posted in Chugoku and tagged A-bomb Dome, Atomic Bomb Dome, castle, dome, Ebisucho, Hiroshima, Hiroshima castle, Hiroshima Industrial Promotional Hall, Hiroshima Peace Memorial Park, Hiroshima Station, Hiroshima-jo, Hiroshima-ken, Industrial Promotional Hall, japan, Mazda, Memorial Park, Momiji Manju, museum, Nozomi, nuclear bomb, Okonomiyaki, omiyage, park, Peace Memorial Park, samurai, Shinkansen, Shintenchi, shopping arcade, Travel by Dru. Bookmark the permalink.